Yesterday Egils and I transported my just-finished sculpture to the Barn Gallery in Ogunquit, Maine for the Invited New England Sculptors exhibit. 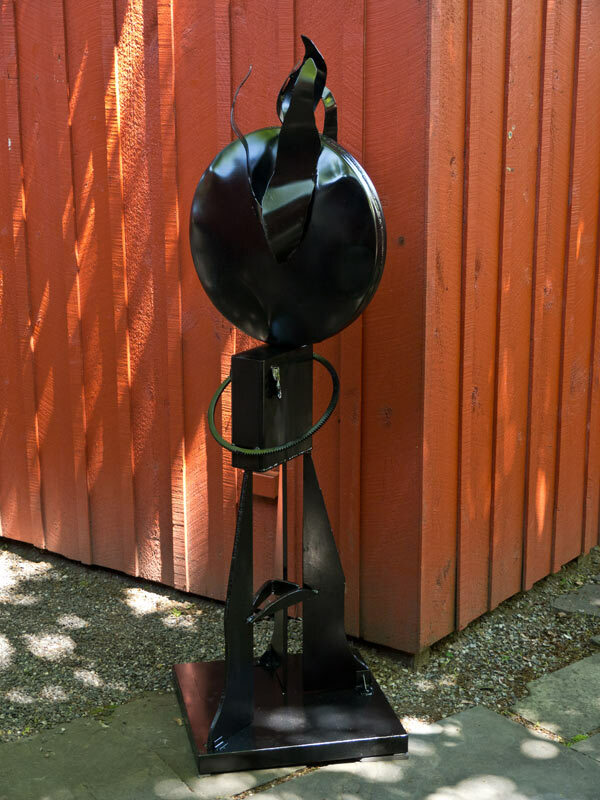 Lindley Briggs has been curator for the show each summer for a number of years and I have been fortunate that she has the patience to include my work in the sculpture courtyard each year. She has a large wall panel of her own in the exhibit and there are also works by Antoinette Prien Schultz, Gary Rathmell, Michael Alfano, John Weidman, Nancy Sander, and a number of other good sculptors. These works range in scale from small to fairly large and include bronze, steel, clay, fiberglass, and other media. Within the gallery is an extensive group show that includes both 2D and 3D works by many known regional artists. The opening reception was Saturday May 26, 5-8, but you have the entire summer and beginning of autumn to see these sculptures and more. Then afterwards you can go for a walk along the Marginal way, then have a lobster dinner at one of the many nearby restaurants. Art, the ocean, and fine food – what more can anyone desire? This entry was posted in sculpture and tagged Joyce Audy Zarins, sculpture. Bookmark the permalink. Post a comment or leave a trackback: Trackback URL. What a powerful work of art. I hope to be able to see it in person this summer. Hi Diane. It’s great that it interests you. There are a few pieces outdoors, but if you go inside, you will find a courtyard where there are more, in a range of media, and that’s where mine is. The Barn Gallery is a good venue and Ogunquit itself is fun. The Ogunquit Museum of Art is also nearby and overlooks the ocean. You could have quite a day there, if you go.